The show is beginning. We spend all year thinking about Alumapalooza, and when it finally comes together here on a patch of grass in central Ohio, it’s a great thing. Today is the day. The past few pre-event days have been mellow. All of the volunteer staff are very experienced at their jobs, and we’ve cross-trained people whenever possible, so if we hadn’t been required to relocate some things as a result of the factory expansion there wouldn’t have been much to talk about. Everyone would have just gone ahead and done their job without any instruction. As it was, things were still pretty smooth. We’re lucky to have such great people who come back year after year to make this event happen. A lot of attendees are repeat visitors, too. 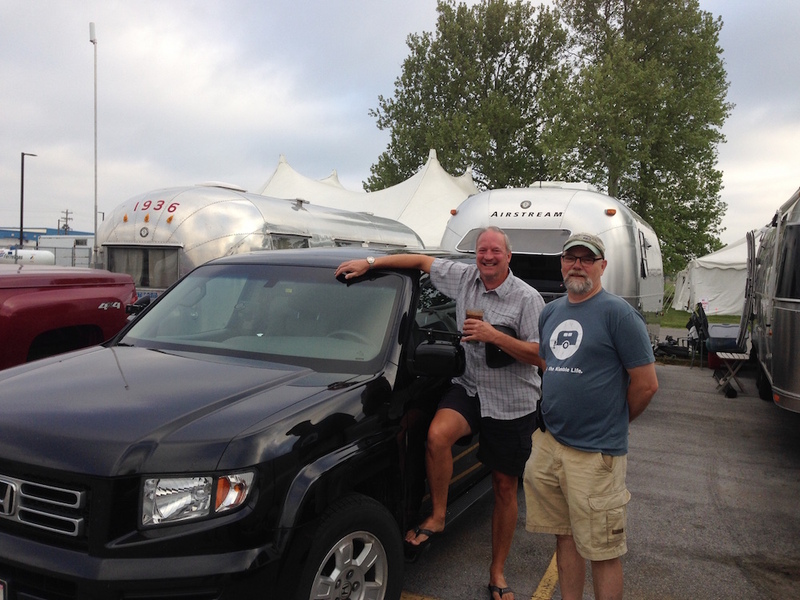 We had 25 spots in the Service Center lot for early arrivals to boondock a few nights, and most of them were taken by people who had been here before. They just roll in at their convenience, settle in, and gab with their neighbors. We didn’t schedule anything except a cookout on Memorial Day, but the folks who arrive early generally don’t need scheduled activities to stay entertained. Jackson Center weather is always tricky this time of year, with frequent and un-forecast changes. When people ask us what weather to expect, we say “all kinds.” This year has been a great example. When I arrived it was dropping down to about 42 degrees at night. Other years it has been 101. You just never can be sure what’s coming, despite the attempts of the weather reporters to stay ahead of nature. This year the major weather event has been wind, lots of it, which finally got strong enough to make everyone take in their flags, awnings, and patio mats (or stake them down very securely). I was working on the roof of the Airstream with Super Terry over the weekend, scraping old cracked sealant off the aluminum with a putty knife, so that we could re-seal a couple of spots that might have become leaks. When I’d get a small piece of sealant scraped free, it would sometimes blow right off the roof. Because of the uncertain weather, we decided to keep the job list to the bare minimum, so all we have done so far is replace the entry door lock and replace sealant in six or seven places. Sometime this week I’m still hoping we can remove the wheels to check the brakes, but now that the event has started it will be hard to find the time. I might have to get to that job at a later stop in our travels. The big news has been that E&E will miss Alumapalooza. They had planned to catch up with me by flying to Dayton, but Emma got a cold a week ago and still can’t equalize well enough to fly. Our only good option was to have them fly to Cleveland next week, where I’ll pick them up as I’m heading east with the Airstream. So I’m still solo in the Airstream and will remain so quite a lot longer than I had expected. Without Eleanor to back me up, I’ve had to make some adjustments and rely on the support of friends. There’s still plenty of food in the refrigerator but friends here have been inviting me to dinner nightly, which means I probably won’t have to go grocery shopping until next weekend. That helps a lot, because during one of these events my time is always at a premium. Our friend Mary has volunteered to throw my laundry in with her family’s on Thursday (she pointed out that Eleanor has done the same for them in the past). Others have offered help, too. It’s nice to have such good friends. In this community you can almost take that for granted, which is a big part of the reason Airstream has been so significant in our lives. As I mentioned, the factory expansion has changed a few things. We can only park about 50 Airstreams in the main field next to the factory, so Airstream personnel electrified another area closer to the Terra Port, and we plan to put another 50 or so there. This also meant the event tents couldn’t go in the usual spot, but we found a really pleasant location in the shade of mature sycamore trees, right next to the Terra Port. The grass is nicer, the ground is more level, and we like how it turned out, so we’ll probably do it the same way again next year. This also means the staff can park in the Terra Port for the entire event. After six years of parking in the field, I think the volunteers deserve the perk of full hookups during Alumapalooza. They work hard, sweating and getting sunburned (or rained on) every day for a week, and at the end of the day they have to haul the gray water from their shower several hundred feet in a portable tank to dump it. Most of them didn’t get power for air conditioning, either. 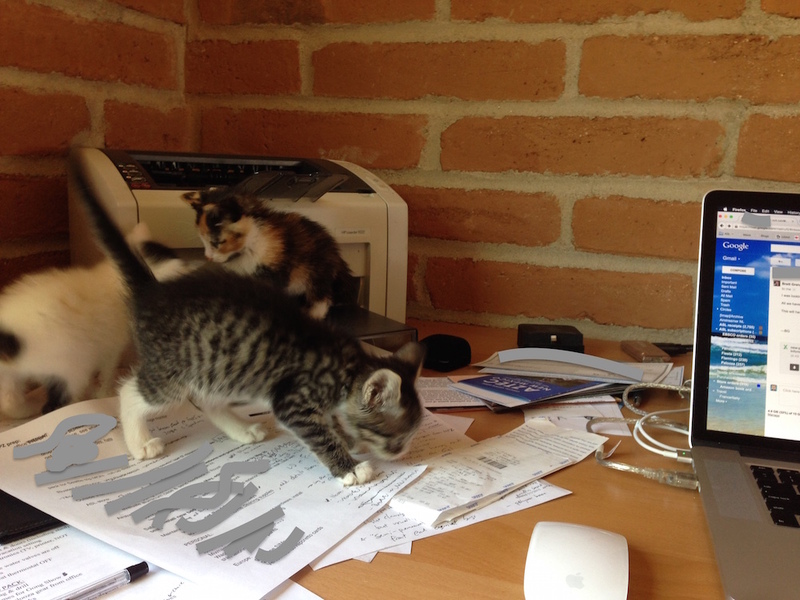 We supplied them with ice cold water, laundry service, and a free pass—that’s it. So now they have a well-deserved better deal. Our new spots in the Terra Port put all of the staff very close to the tents, so they can go back and forth quickly, and if the windows are open you can hear the chatter and laughter of attendees having a good time nearby. It’s perfect. By 9:30 this morning we had already parked 25 trailers and a steady stream has continued to come in. It’s starting to look like Alumapalooza today, with rows of shiny Airstreams parked in the grass, flying flags and displaying lawn chairs and patio furniture under the awnings. By the end of the day we will have close to 100 parked, and more coming on Wednesday. One of our special guests this year has been Jessie Kresa, a professional wrestler, who is here to show off her hot sauce. She was featured in Airstream Life in our Winter 2014 issue, and it’s great to finally meet her in person. Tonight she’ll join us on stage and give away some stuff, and then on Thursday she’s off to London England to wrestle someone to the ground. After meeting her, I suspect quite a few guys here are going to wish it was them. I’ll be running a couple of events later today, so for the morning I’m just watching the parkers and water/electric crew do their job. This afternoon the program starts at 2:30 and runs to 8:00, and then tomorrow we go into it full-tilt starting at 7:30. After a decade of driving across country to stay in the Airstream Terra Port, it’s amazing I still have anything to say about it. But every time I get in the last few miles on I-75, or that two-lane country highway that leads straight as an arrow between the soybeans and corn fields, right to Airstream, I feel a little quiver of excitement. 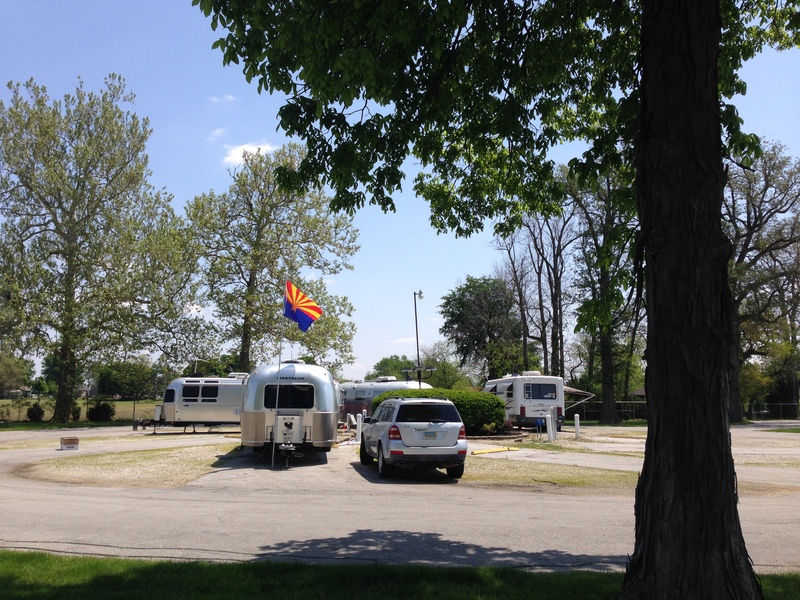 Airstream, and the little Village of Jackson Center, Ohio, are as familiar to me as old family members and as enjoyable to anticipate as a vacation cabin. The expansion is good news for everyone, except perhaps the organizers of Alumapalooza. We’ve lost half the field we formerly used for parking trailers, so we had to scramble to re-organize the parking plan and electrical lines in order to accommodate 125 Airstreams. It got figured out eventually, and in some ways the parking plan is better, so in the long run the factory expansion might even turn out to be a good thing for us too. It certainly will be good for Jackson Center. We love this town, but the local businesses have often struggled economically and there’s always been the threat that the downtown would go the way of so many others, with empty storefronts and sad remainders. Airstream has been the anchor that has kept JC alive, and now with more Airstreams being sold, there’s reason to believe that JC will get a well-deserved boost. I was talking with the restauranteur of the beautiful brick building nearby, formerly known as The Verandah restaurant. This old Victorian-era house was once a boarding house that Wally Byam himself stayed in. He told me that he’s been waiting all year for Alumapalooza to come back, since it’s the biggest economic injection the village gets. For the week we are here, he needs extra staff. That made me glad, because we have always tried to leave something positive behind, and support the local businesses whenever possible. We buy all our consumable supplies locally, even if we could get a better price 30 miles away in Sidney. This year the local restaurant will be doing our catering. Our attendees flood the local stores, watch movies at The Elder Theater (one screen, right in the center of town), attend the JC Community Days fair, walk to town for ice cream, and run in the annual Tiger Trot 5k race. We donate hundreds to the local Food Bank (proceeds from our charity auction and Gong Show). While we are here, Jackson Center is our town. I’m set up in the Terra Port for the duration. 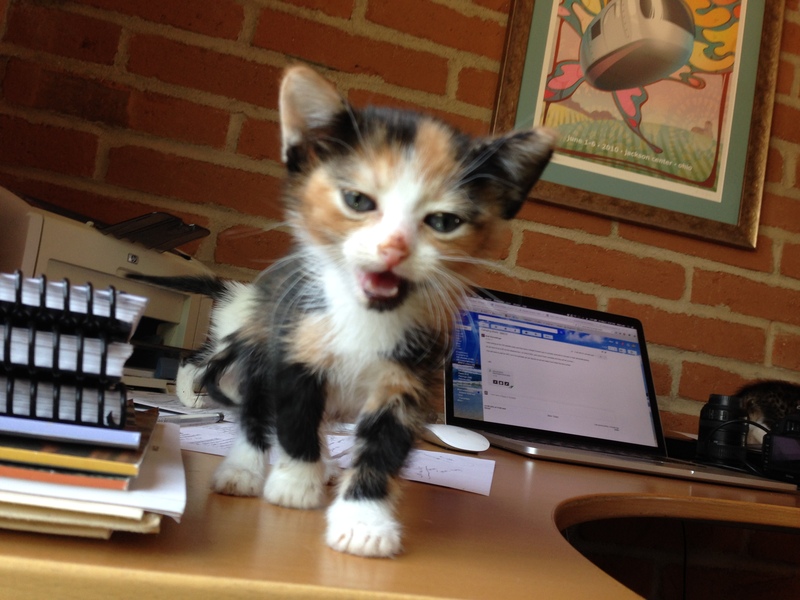 Unlike prior events, the staff will stay here until the end of Alumapalooza, so we’re making ourselves comfortable. I put up my new Arizona state flag just to try out the new flagpole. 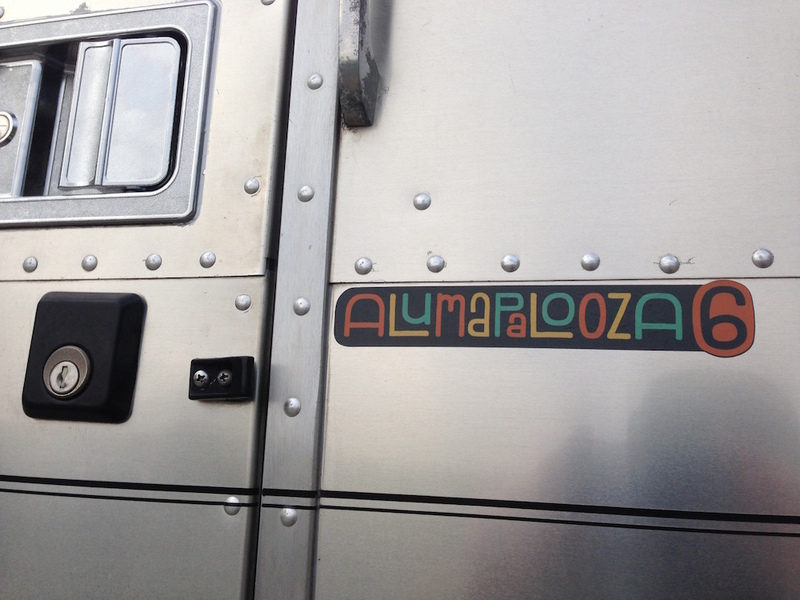 When Alumapalooza starts, I’ll put up the rest of them, including the Airstream Life flag. I don’t know why, but flying flags is a big part of rally tradition. 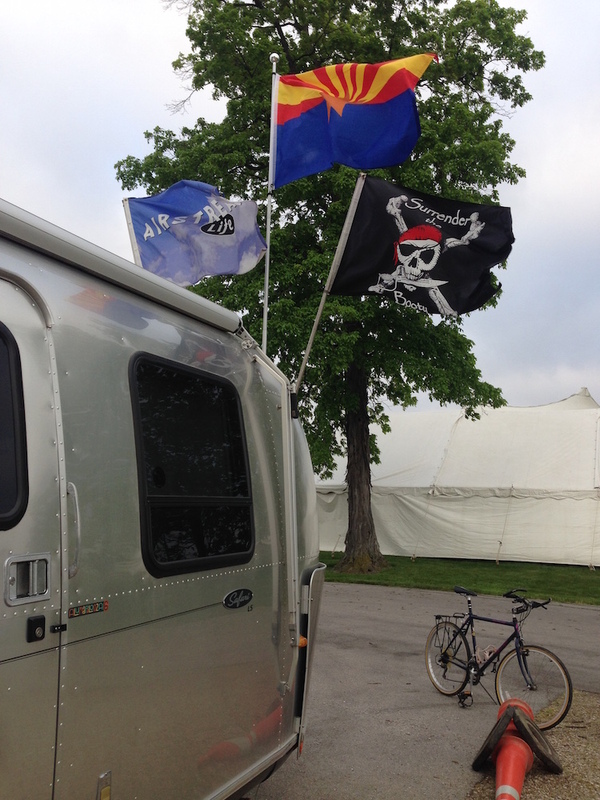 I like the color and personality flags add to a field of silver Airstreams, so I have a variety. The “We take no prisoners” Jolly Roger will be flying too. Today is Friday, four days before the event. We’re doing some light prep work now, and as the rest of the volunteer staff gather, things will really start to get busy. 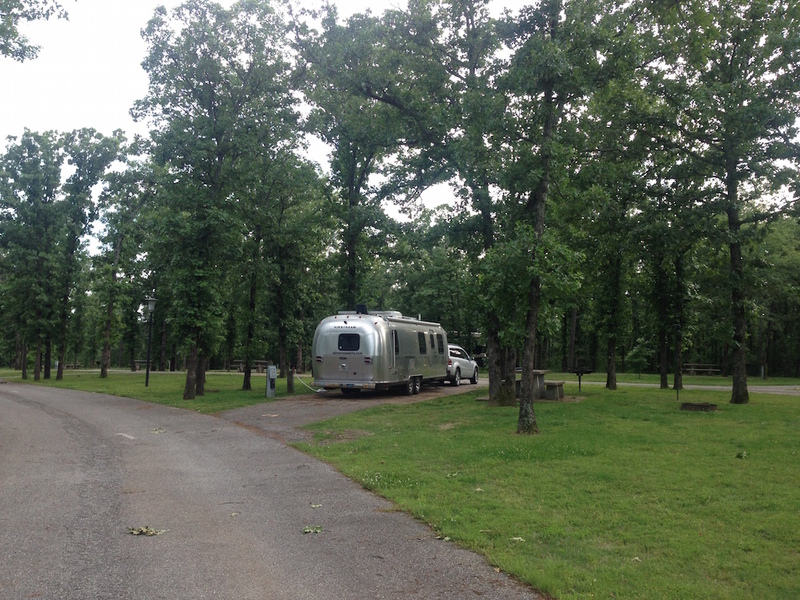 Over the weekend we are expecting about 30-40 Airstreams to arrive for a sort of pre-party that we traditionally hold, with a cookout on Memorial Day and lots of socializing. They’ll mostly be parked in the Service Center lot without hookups, but nobody cares (we’re all in Airstreams, so who needs hookups?). They’ve come for the fun. That’s what it’s all about. No wonder I like coming here. I’m on the road at last, for my big solo trip from Arizona to Ohio. The day was sunny and surprisingly cool for southern Arizona in May, so I put the pedal down and began cruising along I-10 at 70 MPH. (I don’t run ST tires with their anemic 65 MPH speed rating, and my rig is very carefully hitched up, so 70 MPH is no problem on good road.) The miles just flew by, and it wasn’t long before familiar roadside sights began to show up. Maybe it was the happy car and trailer affecting me, or perhaps the fine weather, or perhaps the very nice send-off from my wife and daughter (who will join me in a week), but for whatever reason I just kept on rolling. 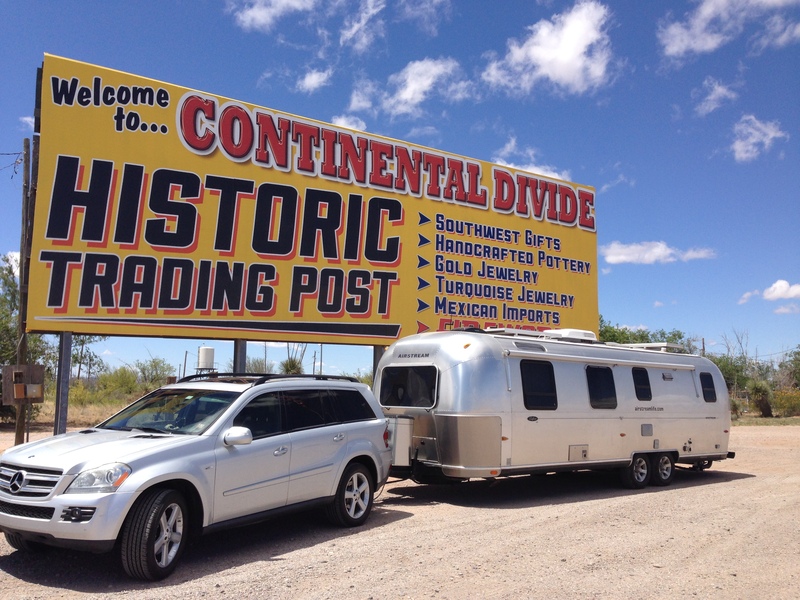 Soon I was passing through central Las Cruces and its collection of historic signage along Rt 70, then through the White Sands Missile Range, and in the afternoon I found myself in beautiful northern New Mexico with a minor problem. I had absolutely perfect weather on Saturday. Not a cloud in the sky, dry air, temperatures perfect for sleeping, but there was, somewhere in the northern part of New Mexico and not a clue where I was spending the night. The campgrounds along my route were bad and overpriced, and there were few overnight parking spots to choose from. So I kept pressing the accelerator and running down the road until the sun set … and beyond. It was 10:30 pm local time when I finally pulled into a parking lot in Amarillo TX, 690 long miles from Tucson. Not as bad as it sounds since I’d crossed two time zone boundaries and for me it was only 8:30. This ridiculous slog meant I’d covered more than a third of the trip in a single day, and that was great because it meant I could slow down for the rest of the trip. Tornadoes and hail are always the worry when crossing the Plains states this time of year. Every year I have to dodge something. This year a huge frontal boundary was ahead of me, spawning tornadoes in Texas, Arkansas, Missouri, and Oklahoma. This was the easiest year ever, since all I had to do was stay behind the storm line and enjoy the lovely cool weather. Today’s drive was similar. I-40 all the way, across the panhandles of Texas and Oklahoma. The drive was not much to write home about, but I had a nice time anyway. With an early start and no pressure to get anywhere, I had plenty of time to stop in Oklahoma City to make some calls, and in Tulsa to think about where to go next. Finally I decided to deviate slightly to get off the Interstate and explore something new. 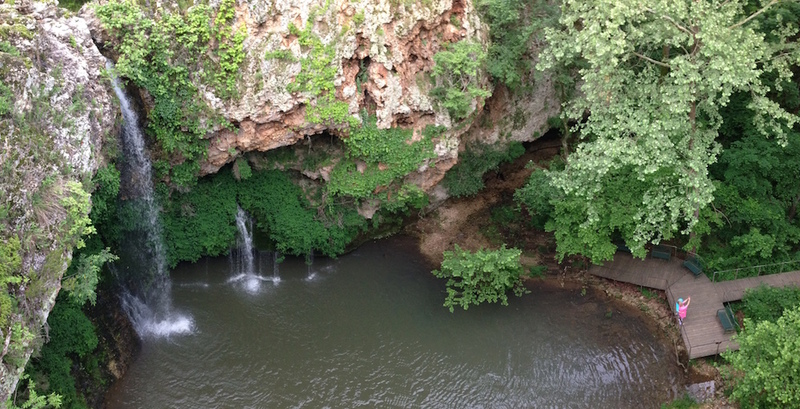 I ended up 438 miles from my starting point, at Natural Falls State Park in eastern Oklahoma, just in time for dinner. The Airstream still didn’t need a campground. There was plenty of water and the sun had replenished my batteries for free (which always happens by early afternoon this time of year thanks to a high sun angle). But I just wanted to have a quiet place to stop and some scenery around me that didn’t involve a lot of asphalt, so the $20 charged for a water/electric pull-thru spot at Natural Falls seemed like an excellent idea. The park has a nice paved trail that leads to the falls. It was just the thing after two days spent in the car. Time to kick back for a while and think about what’s on the agenda for the next two days. I still want to get to Jackson Center by Wednesday, but other than that there’s no plan. And something happened to put my travels into perspective. The toll booth lady admired the Airstream and said my trip on the turnpike ($5) would be free if I’d just go back five miles and drop the Airstream off at her house. She went on to say how much fun she’d have with her grandkids in it. The compliment was nice, but on balance I decided to keep the Airstream. It’s a privilege to have it and I thank her for reminding me. Tonight as I relax in the Airstream, and tomorrow as I explore northern Arkansas I’ll be thinking about that.